A couple of weeks ago Chris at Gorilla vs. Bear turned me onto the mid-eighties psychedelic XTC spinoff group, The Dukes of Stratosphear. While I’d heard a number of Andy Partridge side-project related material over the years, this particular incarnation was news to me. If you’re interested in checking out what The Stranger describes as “a brilliant psychedelic pop pastiche that lovingly combines morsels of early Pink Floyd, middle Beatles, Electric Prunes, Hollies, Kinks, and dozens of other, like-hearted bands…,” then head over to GvB, who just wrote the album up a few days ago HERE. Listening to this inspired homage to ’60s garage-rock and psychedelia got me thinking about Partridge’s songwriting in XTC, and the large body of (varied) work they have amassed over the past three decades. It’s not hard to pick out the X,Y and Z groups of today who are liberally nicking ideas and style from the longtime British band. XTC’s MTV friendly single “Mayor Of Simpleton,” off the Oranges & Lemons LP, was my first exposure to the group back in 1989; the bygone era when the video network still actually played music videos. Seeing these bookish looking Brits belt out this perfect pop nugget, was both refreshing and, at the time, very odd. These were the days when bad hair metal and early hip-hop (back then it was known as Rap, baby) dominated the network, so seeing this video crammed alongside the former was befuddling to my 14 year old eyes and ears. It also made this tune that much sweeter. I just played the Dukes’ “Vanishing Girl” on my show the other week after featuring XTC’s Black Sea on my Sunday night album feature. They’re a band I didn’t get into until a year or so ago, and recently again with full force. Of course I didn’t really get their style of music until I got older, so while it might have intrigued me when I was younger, I wouldn’t have dug into it. But wow, strange how music blogs send out gestalt waves of like-thinking to focus on the same bands sometimes. I loved Oranges & Lemons even more than Skylarking. Fantastic record. O&L, Skylarking, both fine LPs, but the real juice is in the absolutely BRILLIANT trio of LPs they released 1979-1982: Drums & Wires, Black Sea & English Settlement. Essential listening! I got distracted by gorillavsbear’s link to an until-now-unknown band for me, Bodies of Water, and their song, “Doves Circle the Sky.” I don’t recall seeing anything about them on here, but, man, that’s a catchy little pop song. good too. The cover of Oranges & Lemons is almost enough to make me go and buy it. Found your blog via Hype Machine. I know it’s probably a contentious opinion but I think that Colin Moulding wrote the better songs of the two. It’s just that he obviously wasn’t as prolific as Andy. Or was he? Have you heard about Andy Partridge discussing a classic XTC song week in, week out? It’s good stuff. Does anyone know where I can get hold of any XTC memorabilia. News to you? Are you a teenager? I remember when this came out, bought it then, great stuff. And yes, I was even awasre of it in the US Midwest. Partridge did a similar guest spot on that fine LP by that Martin guy from England, forgot his name (Newell? )…anyway, if you like the Dukes, BUY that other album. I did. did you not read the post? i said i bought this in 1989. Thanks for writing about XTC — one of the most under-appreciated bands of all time. XTC is one of the greatest bands ever, IMHO! 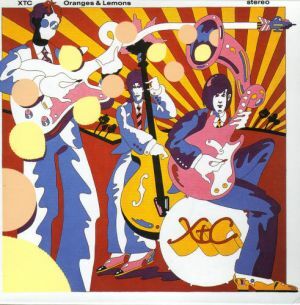 For me, XTC is ranked in the top ten ever along with The Beatles, Led Zeppelin, Pink Floyd, The Who, etc. Anyone with a deep appreciation for quality music who gives XTC a serious listen — especially fans of acoustic guitar — will probably feel the same way.